I’d like to share some personal thoughts with you about why I chose to write in this genre. First off, I’m not a romance reader. I love romantic elements in novels, but have never really been drawn to stories that are all about the romance and little else. I like to sink my teeth into a strong plot with deep characters, and too often romance novels lack both those elements. But romance is a huge part of life—or at least we usually want it to be. Regardless of our age or gender, a good romance story will tug on our hearts. Tales of how a couple met, fell in love, and weathered the ups and downs of life mirror our own lives. We tell such stories in our families, around a table during a holiday visit. We are warmed by hearing how Grandma met Grandpa, and we chuckle at the silly or adorable ways they courted. We all want love, and most of us want that perfect romantic relationship. But it’s not always easy to find. That’s why so many people read romance—maybe for hope, for vicarious pleasure, or for a reminder of what sweet and innocent love felt like (all those many decades ago). I write in this genre because I want to capture some of that—of the sweet, natural, honorable, and inspiring romance that gives rich meaning and joy to our lives. But such love isn’t without its challenges and struggles. By setting my romance stories in the old West, I have many ways to present outside conflict and obstacles that my characters must face. Trying to find, grow, and cherish love when blizzards and drought and locusts are making life almost unlivable tests a person’s mettle. Love in hard times is won through hard effort. And so, when writing sweet historical Western romance novels, I can bring to life a whole cast of various characters that have chosen to live in difficult circumstances. Many have given up lives of comfort to pursue a dream, and when I dig deep into the history of places like Greeley and Fort Collins, I’m moved, inspired, and impressed with the courage and determination of so many of their founders. And my aim is to inspire you, my reader, so that your life will be enriched in some ways it may not have been before picking up one of the Front Range books. It also helps that I lived in Colorado for years, in both those aforementioned towns, and I raised horses as well. Being a huge fan of Westerns (movies and novels), it made sense for me to not only pick this genre but set my stories in Colorado and Wyoming. I’ll be back at you in a couple of weeks to tell you more about the characters and locale of my books, and share some personal stories that inspired some of the plots in my books. 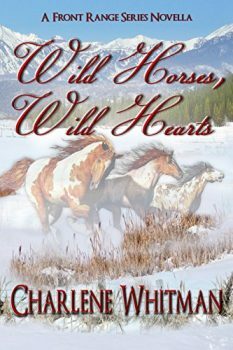 In the meantime, I hope you’ll join my readers’ list and get a free copy of Wild Horses, Wild Hearts. It’s my gift to you! Let your friends know that if they join my readers’ list, they can get a free copy of this novella as well! Just send them to my website! Thank you for sharing in the adventure. Happy reading!